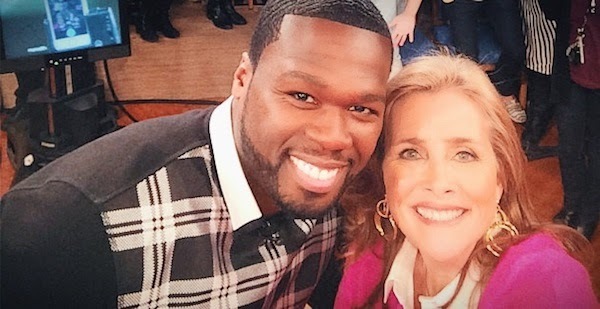 Curtis Jackson aka 50 Cent appeared on season one of The Meredith Vieira Show on 30 September 2014. 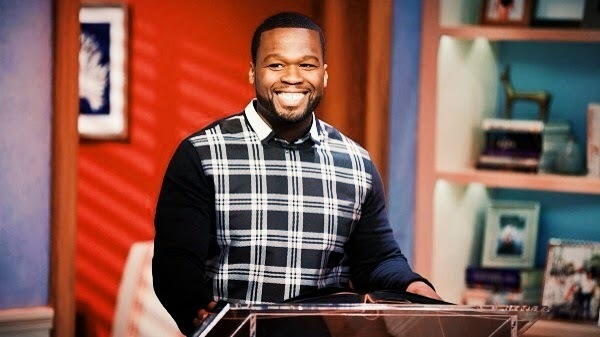 Curtis Jackson wore a black and white silk check jacquard sweatshirt from Alexander McQueen Fall Winter 2014. Jay Z wore the same sweatshirt a few days ago in Paris when he watched the UEFA Champions League with Beyonce and David Beckham. Who wore it better? Towards the end of the show, something incredible happened. Out came the infamous Acer Selfie hat and Curtis Jackson proved a good sport to wear the hat with gusto, much to the delight of the audience. The Acer Selfie hat was unveiled last month during London Fashion Week Spring Summer 2015, and was a collaboration between the technological giant and London based designer Christian Cowan-Sanluis (above left). The oversized pink glitter hat comes mounted with an Acer Iconia A1-840, which by clever design allows one to take the best selfie possible (glitter illuminating the face and tablet positioned at optimal distance away from the face). Shocking hat? Definitely. But what is fashion without a bit of fun. I certainly take my hat off 50 Cent (pun intended), him with all that tough man persona, but who also does not take himself too seriously to fashion the hat. Disappointed with Meredith Vieira though, who took the selfie with her iPhone. I love the iPhone, but doesn't that defeat the purpose of wearing that selfie hat? !